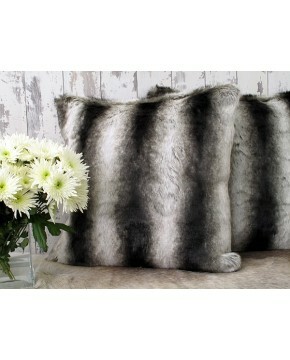 The Grey Wolf design faux fur cushions, as with our wolf fur throws, have been some of the most popular since we began. Perhaps because they are in our lower price bracket yet still offering excellent value for money, quality and style, or perhaps because the colouring makes them versatile and easy to compliment many different environments. Whatever the reasons, the wolf faux fur continues to be popular. 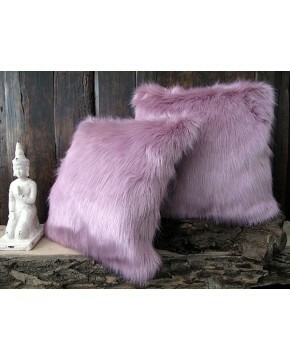 Our fur cushions are available in 2 standard sizes and a choice of either faux-suede or main fur on both sides. If the cushions are intended for use on white or very light leather furniture, please either purchase the main fur each side option, or request ivory faux-suede for the backing. All cushion pads/inners supplied with the cushions are polyester fibre. Because shipping to destinations other than the UK is based on volume and not weight, it is not possible to provide cushions/pillows complete with inners to non-UK addresses. In those instances please order covers only as it would be far cheaper to obtain inners locally than to pay excessive delivery costs. Aftercare - May be machine or hand washed with care. Wash separately on cool temperature. Do not use bleach, do not tumble dry, do not ring. Brush to restore pile/fur before totally dry. May also be dry cleaned. 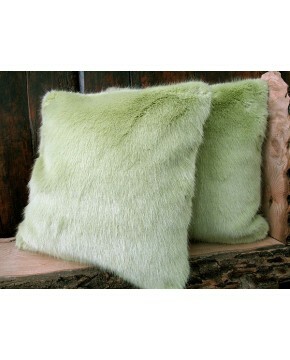 Description: A very competitively priced faux fur cushion or cushion covers. Medium length fur, striped, with greys and brown colouring with tan highlights.